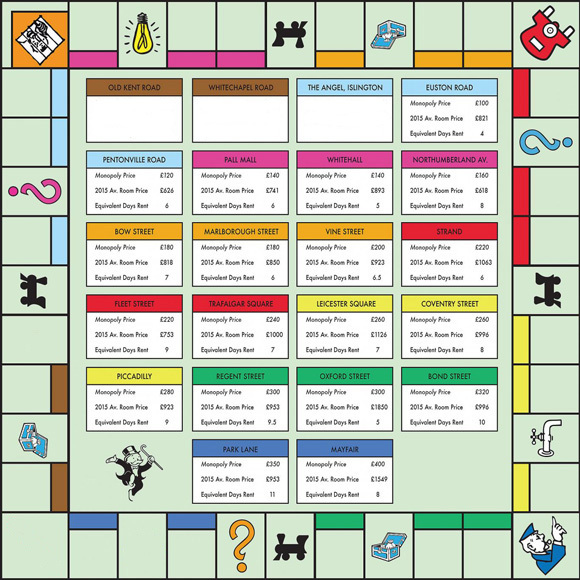 Today we held the Whitechapel Mission Monopoly Challenge event. It was the first time we have organised an event of this scale, so when the 16 teams signed up to enter, little did they know they were the guinea pigs for future fundraisers such as this. We need to raise funds to build an internet style café off the main hall to provide the people that visit the Mission daily, the life skills to cope with the changes in the benefit system and the technological world of today. We are thrilled at how successful the day has been; the teams were fantastic! Enthusiastic, competitive and imaginative are just three words that spring to mind. We had 5 awards up for grabs and we were honoured to have Tom Allen, the comedian from 9 out of 10 Cats do Countdown to do the presentations for us. The “Most Points” award went to Lloyds Banking, a close call as 3Birds and a Beard were winning until the last minute. The “Most Landmarks” hit Award was taken by BNY Mellon, well done to them getting to 26 of the 29 spots. The most “Iconic Photo” award went to Columbia Threadneedle Team 1 who, from out of nowhere got hold of some Top Hats for an iconic pose. Brilliant! The “Most Funds Raised” to date award went to Bank of England who managed to raise well over £1,000. Well done you. And the event wouldn’t be a proper Monopoly Event unless we had an “Old Boot” award which was proudly presented to Paragon International, who looked very pleased to accept this prestigious award. The Whitechapel Mission must extend our grateful thanks to all the teams for taking part, and for being so enthusiastic in their endeavours. YOU WERE ALL BRILLIANT!